"SoundCloud MP3" appends a "Prepare" button to the toolbar section of all SoundCloud tracks which allows you to generate an audio link for these tracks. The generated audio is a 128 kbps MP3 format. 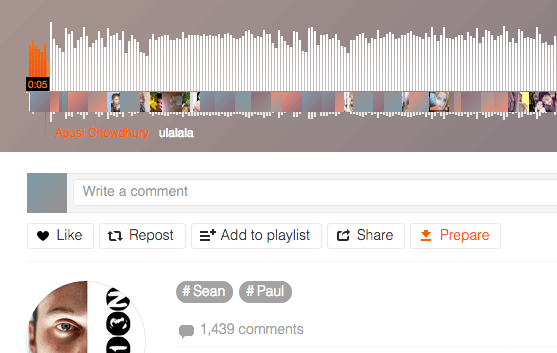 What is SoundCloud MP3 extension and how does it work? This extension provides a convenient way to generate and download SouldCloud audio files locally for later use. Basically an audio link is appended to each track (only if an original download button is not already provided by the track uploader/owner). Pressing the button once generates a downloadable link for this particular track. You can now right click and copy the generated link or press the link one more time to get the file. Note that the title of the track is used as the filename with MP3 extension. Why does audio downloading take two steps? To have a lightweight extension with minimum possible resource usage, only interface (the buttons) is appended to tracks. Whenever, you need to store a track locally, an actual audio link is generated upon pressing the "Prepare" button. What is the meaning of the button's icons? There are two different states for each button. One is "prepare" and the other one is "download". When a button in the prepare state is clicked, an audio link is generated and appended to the button. Left clicking on the right side of the button will get the track for you using the browser's default download manager. Right clicking this area allows you to copy the generated link to the clipboard. This link can be used with an external download manager for a period of time until it gets expired. Clicking on the left side of the button in the download state will generate a fresh audio link for you. Use this refresh button is useful when an already generated link is expired. What is the meaning of the "Prepare" button beneath playlists? Clicking on the prepare button, brings up a popup with all the tracks listed in this playlist. You will see a new set of "Prepare" buttons for each track. Same as normal "Prepare" buttons, you can click each button to request audio link generation. After getting the files, just click on the blank part of the page to hide the popup. What areas in SoundCloud are supported with SoundCloud MP3? Currently the "Prepare" button is appended to: all tracks, track lists and the mean tracks in a SoundCloud page. If there is a new area you would like to have a button for, please open a bug report in the GitHub repo or in the comment section of this page.